[JRASERVER-846] Support for subcomponents - Create and track feature requests for Atlassian products. Thanks for providing your thoughts and votes on this suggestion. I know it's been a while since we last commented on this suggestion and I am sorry to have kept you so long without a clear answer. 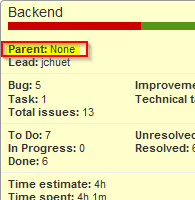 As Jira server team we have once again reviewed how this suggestion is aligned with our strategy and priorities. I am affraid we are not planning to invest in support for subcomponents. While we absolutely understand the logic behind many of the requests for subcomponents, we strongly believe that our focus should be on making Jira simpler and easier to use. Simply put, additional levels of hierarchy for components is likely to add complexity on a conceptual level, at a technical level (more bugs and slower performance) and will lead to a more confusing UI. Since investing in support for subcomponents is not aligned with our strategy and roadmap, we will be closing this issue. I understand that our decision may be disappointing but we also hope you will appreciate our candid and transparent appraoch. Please don't hesitate to contact me if you have any questions. As a person responsible for running the project I need to have the tools aligned with my projects' structures. My projects are organised in a large hierarchical groups of components. I need to be able to assign the JIRA issue to a whole group of components, as well as individually to any component within the system and be able to interact with issues in JIRA based on this assignment - i.e. all issues for component group, including both issues which are assigned to group as well as issues assigned to individual components within that group. JSWSERVER-5351 Option for Component View / Project Components to be pulled from a cascading select custom field.